PARNEVU Extra Dry After-Shampoo Conditioner is a unique blend of 14 conditioning agents that absorbs quickly into your hair to restore moisture, and to improve body, strength, and manageability. The vitamin enriched formula penetrates the cuticle and absorbs deep into the hair's cortex to repair damage. Rich emollients provide moisture to the hair shaft and protects against heat-based styling damage. Directions for Use: Apply to damp hair after shampooing. Gently work through hair, applying to ends and other damage-prone areas. Leave on 3-5 minutes. Rinse well. 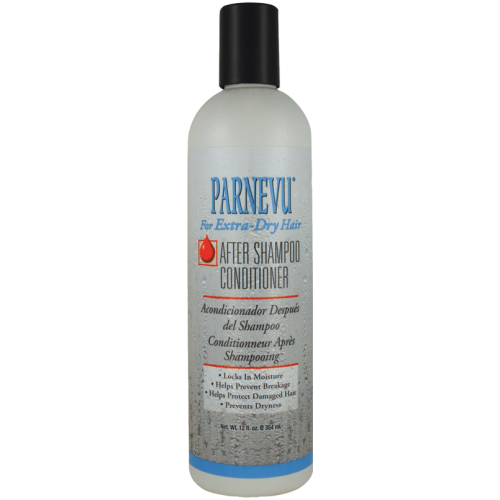 For best results, use regularly after shampooing with PARNEVU Extra Dry Salon Shampoo. INGREDIENTS: Water (Aqua, Eau), Stearalkonium Chloride, Cetearyl Alcohol, PEG-40 Hydrogenated Castor Oil, Glyceryl Stearate, Glycerin, PVP, Panthenol, Hydroxyethyl Cellulose, Sodium PCA. Sodium Lactate, Arginine, Aspartic Acid, PCA, Glycine, Alanine, Serine, Valine, Proline, Threonine, Isoleucine, Histidine, Phenylalanine, Triethanolamine, Citric Acid, Phenoxyethanol, Fragrance (Parfum), DMDM Hydantoin.